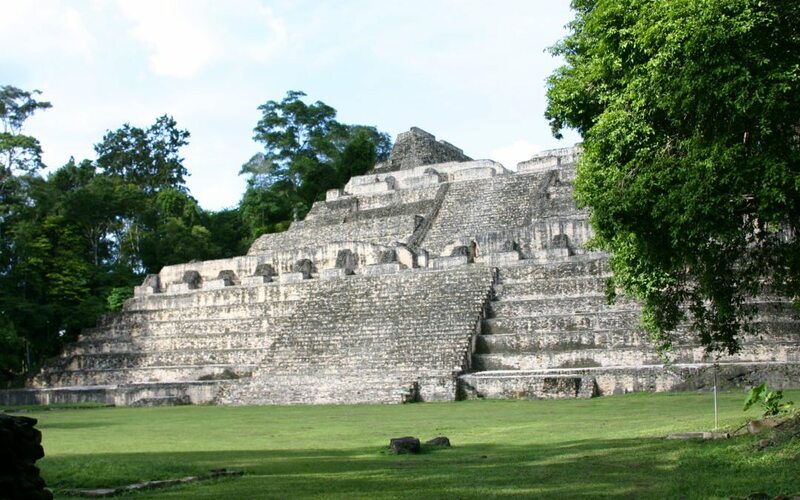 Although it was known that Belize was filled with Maya ruins, most were inaccessible and completely covered by jungle, and there had been very few scientific excavations. Our discoveries in the late 70s were important and proved that Belize hadn’t been a backwater of the ancient Maya but, in fact, was in the mainstream of that civilization. After working on three different archaeological projects, I decided to design a tour to that tiny country. Email and even faxes didn’t exist then, so I had to write letters and mail them hoping I’d get an answer. I did, and thus began the design of the tour. 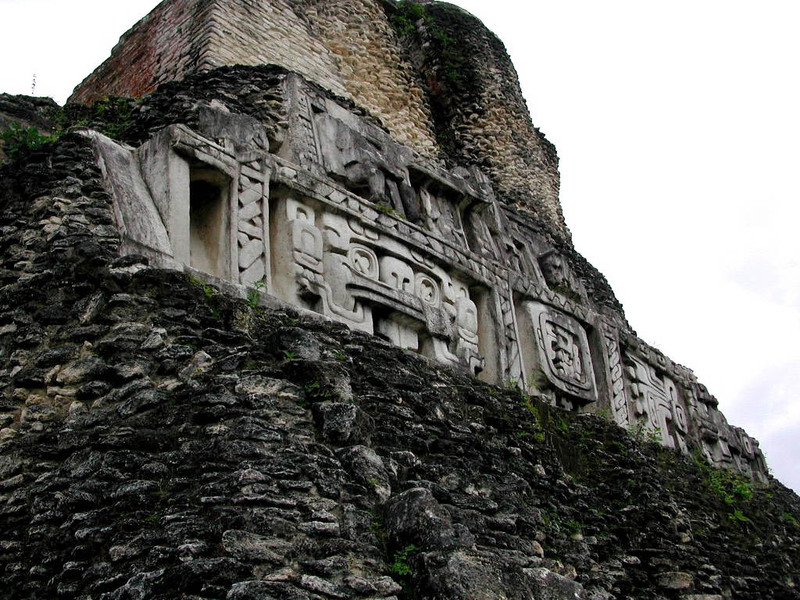 Xunantunich, on the border with present-day Guatemala, was one of the earliest sites found in Belize. You must understand that in 1982, no one in North America had any idea where this exotic-sounding country was located…or even that there was a nation called ‘Belize’. After giving promotional talks anywhere possible, I actually found 12 people who gave me money to join the journey! I was the driver, baggage handler, tour guide, and tour operator on that first trip. Whew! And, oh my, the hotels! To say that they were basic is an understatement. But for some reason, people loved the trip and the word was out. For the next three years, I had the good fortune of showing several groups my lovely home away from home, Belize. We had many adventures – there was the time that one of the van engines blew up in the middle of the jungle and an entire village (well, the men only) came to our rescue in a 1930s logging truck. Then another time when one of the bridges in southern Belize collapsed with us on the wrong side (at dusk) swatting the clouds of mosquitos. The engineers were already there and when I asked when the crossing would be useable, the answer was ‘in a couple of hours IF we can find a log long enough’. Ahh, well, there was an excellent Chinese (honest!) restaurant in Punta Gorda, about 20 miles behind us…so we turned around and off we went in search of chow mein and fried rice. And sure enough, when we returned after dinner, the stream was passable. 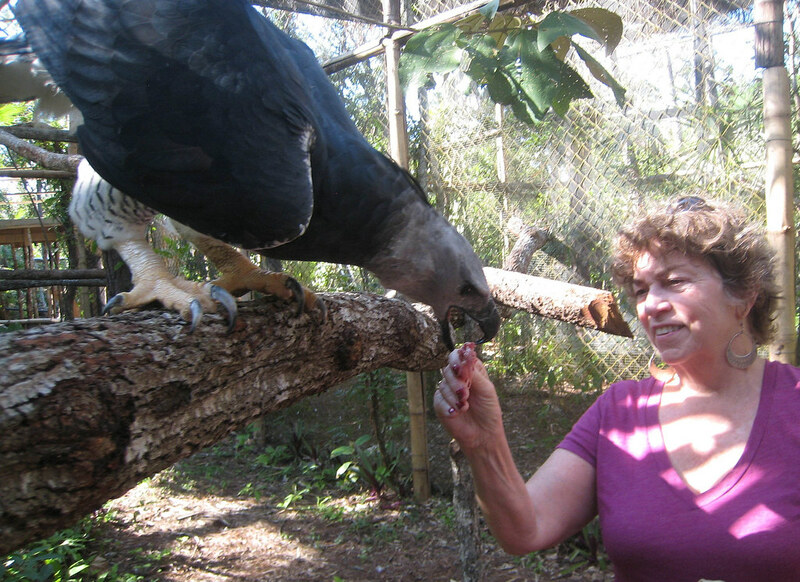 Mary Dell feeding the American Harpy Eagle at the Belize Zoo. Travel to Belize with Dr. Stanley Guenter, January 6 – 14, 2018!